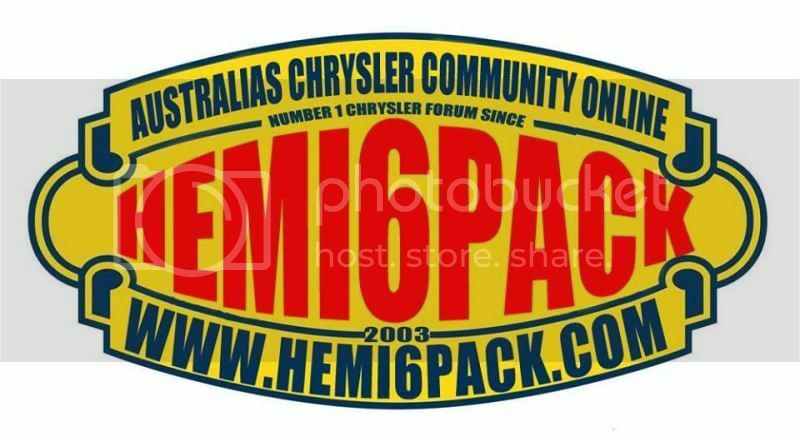 Welcome to the Hemi6pack.com - Australia's Chrysler Community Online!. For general forum announcements, information and assistance. This is the place to visit. Sometimes we'll post some important stuff here. For discussions about life the universe and everything. Post the crazy, insane or just plain funny things you have seen on the web. Off topic and general good times! Show us ya shed, garage, or any other place you like to hang out! Section to talk about those Non-Chrysler related products. There are a few who do care. Wonder what happened to that car you once owned or saw at a show? Discuss it here. This is the place to chat about our beloved Aussie Chryzlerz! General durty smully Valyant yarn. Let's see your resto's and project's. We love pics..
Tell us about your pride and joy. We love to hear about them and see them in their element. US Muscle more your thing? Well look no further, this is where you get your fill! This section is for all general US Muscle discussions. Restoring a US car? Well post it up in here then, and show us all. Show us all your pride and joy! Own a Chev, Ford, Olds, Buick, Lincoln, Pontiac? Post your rides here and discuss these other US cars. Support your local car scene. This is the place to promote your club events, shows and runs. We don't mind All Makes events too..
For these into actually steering their Chryslers and other vehicles. For fans of going round. Numbers, Options and all that hoo ha! Compliance plates and options in here. All the numbers and data that you need. Chrysler Research and Development discussions, History and general information. On topic only please. Paint and Trim in here. Strictly "On Topic" Technical Discussion! Chrysler friendly workshops, traders, and parts! Detailing method and product tips. Got some cool tools? Post about them in here. Gearbox, Diff and Drivetrain Discussion. Alternators, Starters, Wiring, it all goes in here. Paint, Panel and Bodywork subjects in here. Trim, Interior and Upholstery Discussion. Most users ever online was 437, 01-08-2005 at 12:31 PM. Page generated in 0.0759 seconds with 10 queries.